Halloween appears to be the only thing that can motivate me to be consistently crafty. Actually, I recently started crafting again with a group of girlfriends with the plan to get together once a month to socialize and work on projects that we haven't been making enough time for. That has definitely been a step in the right direction to getting back on the crafting train. But every year now, around August, I get the bug to start working on Halloween costumes. This year, I had big plans. When I was a kid, my mom made all of my Halloween costumes. 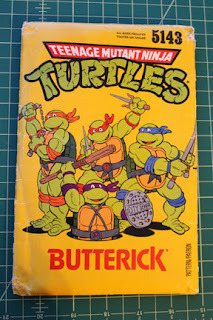 One particularly memorable year, I wanted to be a ninja turtle. She showed me the pattern envelope (Butterick 5143) and I confirmed that it would be the perfect costume. See below. Can you blame me? Front of the pattern... I still think my confusion was very warranted. Little did I know that the front of the envelope looked much different than the costume itself. 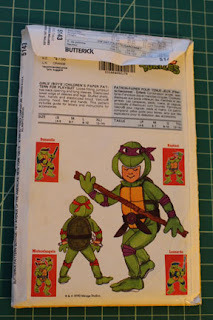 Mainly, the 'mask' of the turtle involved your head being the mouth of the turtle. Clearly, you can see how I wasn't expecting this from the front of the envelope. When it came time to don this outfit, I was not impressed. I looked enviously at the other kids in my school that had their store-bought turtle costumes and was so envious. Now, older and slightly wiser, I still look back at that picture and laugh. So it's only fitting that I wanted to have my kids wear that same costume, especially as I've been brain-washing them into loving the ninja turtles as much as I did. So I hunted down the original pattern. Thankfully, eBay had several sellers offering it. My plan was to make a whole set for the family in time for Halloween. Unfortunately, I dragged my feet on starting the costume. While I purchased my fabric pretty early on, I waited until mid-September to start assembly, thinking a month would be plenty of time. But our weekends are pretty jam-packed already, as are weeknights with my teaching schedule. So I waited until my mom came to town and we cut out and assembled the main jumpsuit for the boys. I had already traced out some pattern pieces on Swedish tracing paper so that I could use the various pieces over for each size variation. The boys could both be based off of the smallest pattern size, and James and I could use the largest for our accessories. I purchased a separate pattern for our jump suits. In the time it took from me purchasing the fabric and beginning the assembly process, I apparently forgot what was required. My mom and I put together the jumpsuits in a thick dark green fleece. Later that week, after she left, I went to work on their shells... only to realize I had used the shell fabric for the jumpsuit and had a whole, unused bolt of a lighter green cotton that I was supposed to use for the main body piece. Much cursing ensued. Fitting for the costume. The head wasn't stuffed yet but a view of the shell. I salvaged what I could of the dark green fabric and thankfully, having already made the main pieces two times, the next two went much faster. Overall as I made each pattern section the second, and then third time, I became much more efficient... though it was still one of the most time consuming clothing projects I've done. I have so much respect for the amount of time my mom spent on our costumes. The hardest part was probably the hood, though the shell was the most time consuming due to the amount of hand-stitching required to baste the designs into the shell. I ended up finishing the costumes for the boys on Sunday the 21st. I was so disappointed that I wasn't going to be able to make our costumes in time for Halloween festivities that Friday, but especially mine as I wanted to recreate my original Michelangelo costume. I decided to bite the bullet and go for just one more. I ended up working on it all day Sunday and then Monday and Tuesday evenings. There was no way that I could finish the fourth turtle so I went ahead and ordered the villain, Shredder, from Amazon. I think if I had a complete full day again in addition to the evenings, I would have been fine but our next weekend was already booked with costume instances so there was going to be no way to get that time. It ended up working out perfectly and the boys loved having the 'bad guy' to mock play with. The boys loved following along with my progress and trying on the pieces as they were completed. I wanted to take some pictures of the family all dressed up in some sort to urban or sewer/tunnel type setting. Obviously without going into a sewer. I had thoughts of a few tunnels I go through on regular weekend runs but my friend suggested the Free Expression Tunnel on NC State's campus. It's not too far from us and online pictures looked promising. We headed over there on Friday afternoon after the school Halloween parade. I was not expecting it to have quite so much foot traffic. While the tunnel was really cool, and felt like the perfect backdrop, it was a steady stream of students walking around campus. I almost called it quits but after a quick texting session with my friends, they convinced me to do it. The kids had so much fun during our little photo shoot and didn't want to take their costumes off after. We received plenty of stares and laughs from the students, most of which seemed to be quite familiar with the ninja turtles. We have a few more Halloween festivities coming up so I'm looking forward to getting as much use out of these costumes as possible.